I was just having a conversation with a friend about being in a job that energetically makes her feel small when she walks in the door. We went round and round and end up back where we started at the beginning, trying to dissect do you stay or do you move on. The beginning of our conversation was; how do you find joy in doing something that doesn’t resonate, that isn’t miserable, it’s just sort of there, not inspiring or creating growth, but just doesn’t maybe fit quite right anymore or doesn’t allow you to be totally you! As we went around and around, talking about the energy of how these situations in our life made us feel, we came back to the question and discovered the only answer was right were we started. DOES IT BRING YOU JOY? That is really the only thing you need to ask and the only thing you need to focus on. You don’t need to go down the rabbit hole and look at all the things that are wrong, don’t feel right or make you feel small. All those statements take you back to exactly those feelings. Esther Hicks and Abraham say, don’t go there. Focus on where you want to be and the feeling of that. If not, you are attracting more of what you don’t want, not what you want. Law of attraction will dictate that and keep bringing more of the same to you. Think of yourself as magnet, do you want to bring into you more of the same or what you want to create now! Joy is our nature, it’s our light and from a place of joy we find our inner knowing and power. So, does it bring you joy? The hardest part and the first thing to do is admit if it brings you joy or not. This is you, deep down inside you, not what your significant other, your family or others think, believe or even say you should do. We get so caught up in our beliefs, that have held us hostage for so long, especially those handed down from our families or our culture growing up, that we first have to determine what is ours and what is theirs. Sometimes when it’s time to let go, it’s time to let go, and then trust the universe to support you. I had a client who went to yoga classes because I recommended them. She finally admitted she didn’t like yoga, even through her friends loved it. She felt like she was supposed to love it, just like them and didn’t want to let me down by saying yoga wasn’t for her. We talked about it and found she would rather walk outside, be in nature. We came up with more of a walking meditation she can use to unwind, create space in her mind and her body, just like yoga does for others. You don’t have to like or do what others like or do. Yoga didn’t bring her joy, once she admitted that, she felt better and was able to stay dedicated to a practice that was right for her! An affirmation you can use:”today not matter where I am going, who I meet or what I am doing I choose to find joy!” I would love to hear your thoughts on joy? ← Does January 1st Start Out Like This? The same old resolutions? 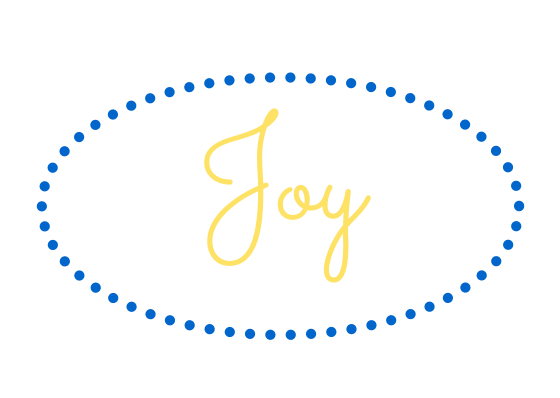 2 Responses to What Brings You Joy? I love that Alice! The first time I went to ride Slick Rock in Moab they had the same painted stripes across the rocks! I remember it well, but I love how you connected to connect the dots as a kid and made it fun to explore and play. Being in joy feels sooooo good and really it is pretty easy to do, be curious and more child like in your life and make your life play, not work! Thanks for the insights and comment! Hugs!